We stock a huge range of batteries for all kinds of uses. With over 2000 different items in stock, plus access to thousands more, we pride ourselves on being able to get almost anything. From the everyday AA, AAA, C, D, N cells, 9V blocks and rechargeable options of most batteries, plus batteries to suit mobile phones (Samsung, HTC, Nokia, LG, Huawei, Doro, Blackberry, Apple and others) digital and video cameras and more. We also stock a huge range of speciality batteries, including hearing aid batteries (10, 13, 312, 675,) 1/3AA & 1/2AA 3V and 3.6V lithium, 4LR44/4SR44 for citronella dog collars, and 12V SLA for house alarms, NBN battery backup systems and various other uses. Of course, we also stock a huge range of watch batteries and car remote batteries, and can fit almost all of them while you wait. We proudly stock and recommend Fujitsu (FDK) one of Japan’s leading battery manufacturers. Fujitsu consumer & industrial batteries offer superb quality, premium performance and outstanding longevity. FDK’s portable battery line-up includes both industrial & consumer Nickel Metal Hydride (NiMH) cylindrical & coin type rechargeable cells and non-rechargeable dry cell alkaline, heavy duty carbon and lithium primary batteries. We also stock watch and buttons batteries from Maxell and VARTA. High capacity NiMH batteries with superior charge retention makes Fujitsu Rechargeable batteries ideal for situations where alkaline, lithium or other rechargeable AA / AAA size batteries are currently used. Pre-charged with solar energy at the FDK factory Fujitsu Rechargeable batteries are ready to use straight from the pack without needing charging first. Recharge up to 1800 times! You’ll use thousands of alkaline batteries just to match the overall life and performance of Fujitsu Rechargeable batteries. Low Self Discharge means Fujitsu Rechargeable batteries are still ready for use even after long periods of storage – up to 90% charge remaining after 1 year or 70% after 5 years! Environmentally friendly – Fujitsu Rechargeable batteries and packaging are completely recyclable. Fujitsu Rechargeable batteries can be charged on any chargers made for NiMH batteries. What makes the Fujistu batteries a better option than normal consumable batteries? Our range of replacement batteries for digital cameras, video cameras and mobile phones means you’re never going to be without charge for that ‘once in a lifetime’ photo or important business call (or instagram photo). We also have a huge range of replacement batteries for many other devices, including WiFi modems, GPS devices, torches and more. We can also source speciality batteries for medical and industrial use. We are also able to supply, and fit, an extensive range of watch, car remote, and various other batteries. All batteries come with a 12 month warranty from date of purchase. Warranty is conditional in accordance with manufacturers parameters and guidelines. 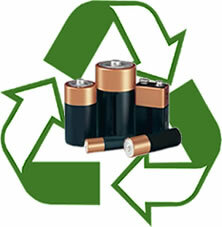 At the moment we are unable to accept consumer batteries for recycling due to the changes in waste management in China. We are, however, able to recycle Sealed Lead Acid batteries from home securing systems and NBN backup batteries still.